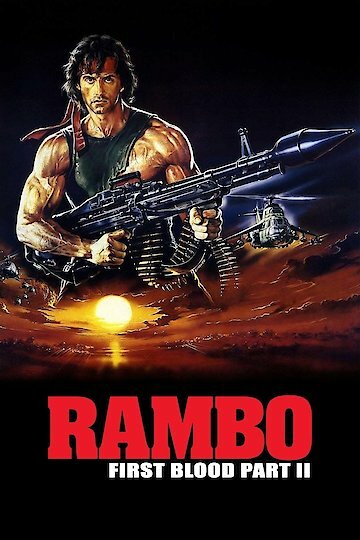 Rambo First Blood Part 2 is an action/war film that came out in the year 1985. It is the second part of the Rambo film series. The movie was among the highest grossing films of the year and was widely popular. It was among the most highly anticipated movies of that year as well. In this movie Rambo is taken out of prison by his former commanding officer Sam Trautman. He is asked to go on a reconnaissance mission to Vietnam to locate missing in action prisoners of war. Over the course of the film he gets double crossed and must rescue the POW’s. He eventually brings them back to the base and allows them to return home. In the year 1985 Rambo is currently serving a several year sentence in prison due to a number of incidents that occurred in the previous film First Blood. During one day he is approached by Sam Trautman his former commanding officer. Trautman tells Rambo that he will be released from prison if he agrees to go to Vietnam to find missing in action prisoners of war. Rambo is also told that if the mission succeeds he will receive a presidential pardon. He agrees and goes off to Vietnam to meet with an official who is in charge of the operation. During the initial meeting Rambo is told that he is to take photos of the prisoners and then return. Due to the official making a false claim about prior military service, Rambo gets suspicious and tells Trautman that he is the only one that he trusts. Rambo parachutes into Vietnam and meets with a local native intelligence agent. The agent and Rambo go to the POW camp and find the prisoners of war. As a result Rambo takes one of them out of the camp and tries to get back to the extraction point. Along the way Rambo, the agent and the POW are attacked by the Vietnamese military. Once the American base tells the official that Rambo has an American POW he orders the mission to be aborted and the remaining personnel leave Rambo to get captured. With the help of the agent, Rambo escapes the POW camp and battles the Vietnamese and Russians on his way out. In the end Rambo gets on a helicopter, blows up the camp and rescues the remaining POW’s. He brings them back to base after killing the Russian commander. When he gets back to base he confronts and threatens the official in charge of the operation and tells him to locate any other POW’s that remain. Rambo walks away and presumably remains in Thailand where the American base is located. Rambo: First Blood Part II is currently available to watch and stream, buy, rent on demand at Amazon, Vudu, iTunes online.